We look forward to welcoming you to Mercure Warragul. Feel welcome to contact me if I can help : gm@mercurewarrragul.com.au or +61 03 5618 3500. 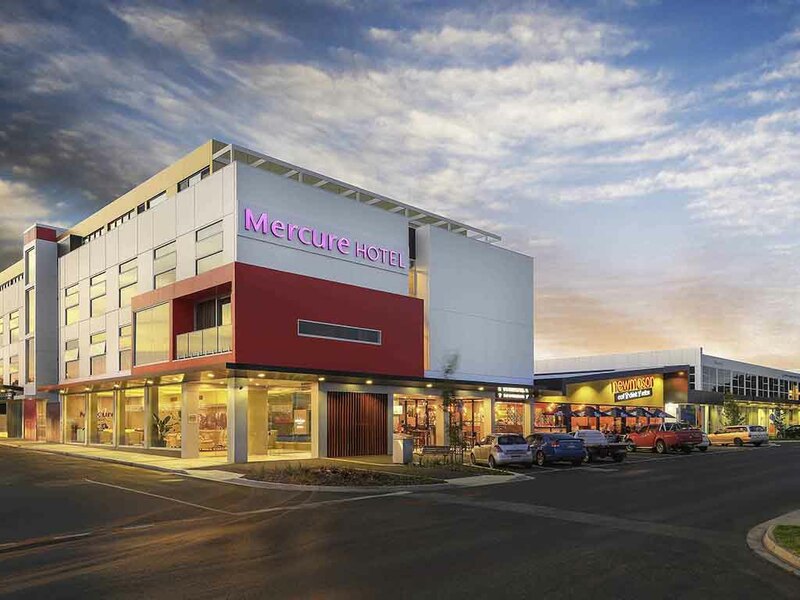 Ideally located in the heart of the CBD with direct access to shopping, restaurants and the popular West Gippsland Arts and Entertainment Centre, the brand new Mercure Warrgul will impress you from the moment you arrive. The hotel features contemporary de signed rooms, a gym, restaurant, lounge, multipurpose function rooms and complimentary WiFi. Perfect for leisure and business travellers to have an enjoyable stay. Newmason Eat Drink Relax Bistro is part of the Mercure Warragul complex. * It offers breakfast, full bistro dining and wood fired pizzas, with Alfresco dining and a function room options available. *Limited Accor Member benefits available. The Lounge Bar is perfect for guests to relax and have an enjoyable conversation. It features an alfresco area outdoor terrace and TAB facilities. Loyalty Member Discounts not applicable. The Mercure Warragul is a well appointed and very comfortable hotel. Central to the main shopping centre of Warragul, basically everything is at your fingertips. Rooms are spacious and beds comfortable. We enjoyed our stay no problems. Excellent customer service. Dear Marlene G., We very much appreciate your comments regarding your stay at the Mercure Warragul. It is always a pleasure to receive positive feedback. I will share your comments with our team. I am sure that this feedback will serve as an encouragement to all of our staff as we strive to continuously improve the quality of our services. Thank you again for sharing your experience, and we hope your next visit will be as pleasant as the previous one. Sincerely, VIC PAHWA General Manager Mercure Warragul ________________________________________ 23 Mason St Warragul VIC 3820 ________________________________________ T +61 (0) 3 … F +61 (0) 3 … E-mail : gm… mercurewarragul.com.au mercure.com | accorhotels.com Information in this email including any attachment ('email') is confidential, may be privileged and is intended solely for the addressee. Unauthorised recipients are requested to preserve the confidentiality of this email, advise the sender immediately of any error in transmission, and then delete the email from the recipient's mailbox without making copies. Any disclosure, copying, distribution or action taken, or omitted to be taken, in reliance upon the contents of this email by unauthorised recipients is prohibited and may be unlawful. Dear Kristal J., We very much appreciate your comments regarding your stay at the Mercure Warragul. It is always a pleasure to receive positive feedback. I will share your comments with our team. I am sure that this feedback will serve as an encouragement to all of our staff as we strive to continuously improve the quality of our services. Thank you again for sharing your experience, and we hope your next visit will be as pleasant as the previous one. Sincerely, VIC PAHWA General Manager Mercure Warragul ________________________________________ 23 Mason St Warragul VIC 3820 ________________________________________ T +61 (0) 3 … F +61 (0) 3 … E-mail : gm… mercurewarragul.com.au mercure.com | accorhotels.com Information in this email including any attachment ('email') is confidential, may be privileged and is intended solely for the addressee. Unauthorised recipients are requested to preserve the confidentiality of this email, advise the sender immediately of any error in transmission, and then delete the email from the recipient's mailbox without making copies. Any disclosure, copying, distribution or action taken, or omitted to be taken, in reliance upon the contents of this email by unauthorised recipients is prohibited and may be unlawful. Dear Dean F., We very much appreciate your comments regarding your stay at the Mercure Warragul. It is always a pleasure to receive positive feedback and noted your feedback on the allocation of special access room. I will share your comments with our team. I am sure that this feedback will serve as an encouragement to all of our staff as we strive to continuously improve the quality of our services. Thank you again for sharing your experience, and we hope your next visit will be as pleasant as the previous one. Sincerely, VIC PAHWA General Manager Mercure Warragul ________________________________________ 23 Mason St Warragul VIC 3820 ________________________________________ T +61 (0) 3 … F +61 (0) 3 … E-mail : gm… mercurewarragul.com.au mercure.com | accorhotels.com Information in this email including any attachment ('email') is confidential, may be privileged and is intended solely for the addressee. Unauthorised recipients are requested to preserve the confidentiality of this email, advise the sender immediately of any error in transmission, and then delete the email from the recipient's mailbox without making copies. Any disclosure, copying, distribution or action taken, or omitted to be taken, in reliance upon the contents of this email by unauthorised recipients is prohibited and may be unlawful. Booked and arrived very late on business travel, when arrived was greeted by friendly customer service who gave me a complimentary bottle of water and piccolo of wine as they thought I looked like I needed it. After a busy day, you don't know how amazing this gesture was to me. Modern rooms and very clean. I was just in time for room service and enjoyed a lovely steak. Although brief, very much enjoyed my stay. Dear Jessica R., We very much appreciate your comments regarding your stay at the Mercure Warragul. It is always a pleasure to receive positive feedback and glad you enjoyed a warm welcome to the hotel. I will share your comments with our team. I am sure that this feedback will serve as an encouragement to all of our staff as we strive to continuously improve the quality of our services. Thank you again for sharing your experience, and we hope your next visit will be as pleasant as the previous one. Sincerely, VIC PAHWA General Manager Mercure Warragul ________________________________________ 23 Mason St Warragul VIC 3820 ________________________________________ T +61 (0) 3 … F +61 (0) 3 … E-mail : gm… mercurewarragul.com.au mercure.com | accorhotels.com Information in this email including any attachment ('email') is confidential, may be privileged and is intended solely for the addressee. Unauthorised recipients are requested to preserve the confidentiality of this email, advise the sender immediately of any error in transmission, and then delete the email from the recipient's mailbox without making copies. Any disclosure, copying, distribution or action taken, or omitted to be taken, in reliance upon the contents of this email by unauthorised recipients is prohibited and may be unlawful. staff were incredibly friendly, hotel very clean and spacious rooms. Overall great short stay. Dear Nikita R., We very much appreciate your comments regarding your stay at the Mercure Warragul. It is always a pleasure to receive positive feedback. I will share your comments with our team. I am sure that this feedback will serve as an encouragement to all of our staff as we strive to continuously improve the quality of our services. Thank you again for sharing your experience, and we hope your next visit will be as pleasant as the previous one. Sincerely, VIC PAHWA General Manager Mercure Warragul ________________________________________ 23 Mason St Warragul VIC 3820 ________________________________________ T +61 (0) 3 … F +61 (0) 3 … E-mail : gm… mercurewarragul.com.au mercure.com | accorhotels.com Information in this email including any attachment ('email') is confidential, may be privileged and is intended solely for the addressee. Unauthorised recipients are requested to preserve the confidentiality of this email, advise the sender immediately of any error in transmission, and then delete the email from the recipient's mailbox without making copies. Any disclosure, copying, distribution or action taken, or omitted to be taken, in reliance upon the contents of this email by unauthorised recipients is prohibited and may be unlawful. I find the staff totally delightful. They remember that we have been there before (Im sure computer aided) but they bother to make us feel like family .... the room is always clean - what else can I ask for - IF we have a hassle (eg room thermometer seemed a tad lacking in display) it was solved! We will be back. We seriously find the whole experience really relaxing. Hugs to all D xxxxxxxxxx Id go a ten but there must be something Im not finding hehehahaee. EVEN the brekkie place was far more approachable and friendly and accomodating than last time we were there. So a hug to them as well. I know its not YOU as such but you are known by association ... so - onya. EXTRA hellos to the receptionist on Fri as she even remembered us and made us feel very welcome - ohhh OK a hug as well. Dear Drucilla B., We very much appreciate your comments regarding your stay at the Mercure Warragul. It is always a pleasure to receive positive feedback and a warm hug :). I will share your comments with our team. I am sure that this feedback will serve as an encouragement to all of our staff as we strive to continuously improve the quality of our services. Thank you again for sharing your experience, and we hope your next visit will be as pleasant as the previous one. Sincerely, VIC PAHWA General Manager Mercure Warragul ________________________________________ 23 Mason St Warragul VIC 3820 ________________________________________ T +61 (0) 3 … F +61 (0) 3 … E-mail : gm… mercurewarragul.com.au mercure.com | accorhotels.com Information in this email including any attachment ('email') is confidential, may be privileged and is intended solely for the addressee. Unauthorised recipients are requested to preserve the confidentiality of this email, advise the sender immediately of any error in transmission, and then delete the email from the recipient's mailbox without making copies. Any disclosure, copying, distribution or action taken, or omitted to be taken, in reliance upon the contents of this email by unauthorised recipients is prohibited and may be unlawful. Was tired after travelling a full day from New Zealand and had a great sleep before moving on. Arrived late afternoon in time for a meal and a good nights sleep. Had both, including breakfast and moved on early the next morning. Dear Hamish S., We very much appreciate your comments regarding your stay at the Mercure Warragul. It is always a pleasure to receive positive feedback. I will share your comments with our team. I am sure that this feedback will serve as an encouragement to all of our staff as we strive to continuously improve the quality of our services. Thank you again for sharing your experience, and we hope your next visit will be as pleasant as the previous one. Sincerely, VIC PAHWA General Manager Mercure Warragul ________________________________________ 23 Mason St Warragul VIC 3820 ________________________________________ T +61 (0) 3 … F +61 (0) 3 … E-mail : gm… mercurewarragul.com.au mercure.com | accorhotels.com Information in this email including any attachment ('email') is confidential, may be privileged and is intended solely for the addressee. Unauthorised recipients are requested to preserve the confidentiality of this email, advise the sender immediately of any error in transmission, and then delete the email from the recipient's mailbox without making copies. Any disclosure, copying, distribution or action taken, or omitted to be taken, in reliance upon the contents of this email by unauthorised recipients is prohibited and may be unlawful. From the great service at our arrival we could not fault the Mercure in Warragul. The large well appointed room was clean and modern. The bed was large and comfortable. The location is great and central to shops/restaurants/hotels and tourist areas. Highly Recommended. Dear Kevin C., We very much appreciate your comments regarding your stay at the Mercure Warragul. It is always a pleasure to receive positive feedback. I will share your comments with our team. I am sure that this feedback will serve as an encouragement to all of our staff as we strive to continuously improve the quality of our services. Thank you again for sharing your experience, and we hope your next visit will be as pleasant as the previous one. Sincerely, VIC PAHWA General Manager Mercure Warragul ________________________________________ 23 Mason St Warragul VIC 3820 ________________________________________ T +61 (0) 3 … F +61 (0) 3 … E-mail : gm… mercurewarragul.com.au mercure.com | accorhotels.com Information in this email including any attachment ('email') is confidential, may be privileged and is intended solely for the addressee. Unauthorised recipients are requested to preserve the confidentiality of this email, advise the sender immediately of any error in transmission, and then delete the email from the recipient's mailbox without making copies. Any disclosure, copying, distribution or action taken, or omitted to be taken, in reliance upon the contents of this email by unauthorised recipients is prohibited and may be unlawful. Dear Clementina B., We very much appreciate your comments regarding your stay at the Mercure Warragul. It is always a pleasure to receive positive feedback. I will share your comments with our team. I am sure that this feedback will serve as an encouragement to all of our staff as we strive to continuously improve the quality of our services. Thank you again for sharing your experience, and we hope your next visit will be as pleasant as the previous one. Sincerely, VIC PAHWA General Manager Mercure Warragul ________________________________________ 23 Mason St Warragul VIC 3820 ________________________________________ T +61 (0) 3 … F +61 (0) 3 … E-mail : gm… mercurewarragul.com.au mercure.com | accorhotels.com Information in this email including any attachment ('email') is confidential, may be privileged and is intended solely for the addressee. Unauthorised recipients are requested to preserve the confidentiality of this email, advise the sender immediately of any error in transmission, and then delete the email from the recipient's mailbox without making copies. Any disclosure, copying, distribution or action taken, or omitted to be taken, in reliance upon the contents of this email by unauthorised recipients is prohibited and may be unlawful. Dear Gayle C., We very much appreciate your comments regarding your stay at the Mercure Warragul. It is always a pleasure to receive positive feedback. I will share your comments with our team. I am sure that this feedback will serve as an encouragement to all of our staff as we strive to continuously improve the quality of our services. Thank you again for sharing your experience, and we hope your next visit will be as pleasant as the previous one. Sincerely, VIC PAHWA General Manager Mercure Warragul ________________________________________ 23 Mason St Warragul VIC 3820 ________________________________________ T +61 (0) 3 … F +61 (0) 3 … E-mail : gm… mercurewarragul.com.au mercure.com | accorhotels.com Information in this email including any attachment ('email') is confidential, may be privileged and is intended solely for the addressee. Unauthorised recipients are requested to preserve the confidentiality of this email, advise the sender immediately of any error in transmission, and then delete the email from the recipient's mailbox without making copies. Any disclosure, copying, distribution or action taken, or omitted to be taken, in reliance upon the contents of this email by unauthorised recipients is prohibited and may be unlawful. I was on the committee organising the 30th Women on Farms Gathering in Warragul that weekend. I needed somewhere quiet to stay which was comfortable and easy to navigate, given I would be exhausted both evenings. Thank you, Mercure. It was exactly what I was hoping for. Dear Quentin O., We very much appreciate your comments regarding your stay at the Mercure Warragul. It is always a pleasure to receive positive feedback. I will share your comments with our team. I am sure that this feedback will serve as an encouragement to all of our staff as we strive to continuously improve the quality of our services. Thank you again for sharing your experience, and we hope your next visit will be as pleasant as the previous one. Sincerely, VIC PAHWA General Manager Mercure Warragul ________________________________________ 23 Mason St Warragul VIC 3820 ________________________________________ T +61 (0) 3 … F +61 (0) 3 … E-mail : gm… mercurewarragul.com.au mercure.com | accorhotels.com Information in this email including any attachment ('email') is confidential, may be privileged and is intended solely for the addressee. Unauthorised recipients are requested to preserve the confidentiality of this email, advise the sender immediately of any error in transmission, and then delete the email from the recipient's mailbox without making copies. Any disclosure, copying, distribution or action taken, or omitted to be taken, in reliance upon the contents of this email by unauthorised recipients is prohibited and may be unlawful. Beautiful accommodation. Convenient restaurant and situation. Stay was excellent. Registering as an Accor member was difficult however. Site didn't accept my email & password without complications. Annoying to have to enter over & over and then try to create another password that didn't end the matter anyway. Needs to be more user friendly. Dear Pamela M., We very much appreciate your comments regarding your stay at the Mercure Warragul. It is always a pleasure to receive positive feedback. I will share your comments with our team. Please let me know if the issue around your membership account has been resolved otherwise we can also escalate it for you. I am sure that this feedback will serve as an encouragement to all of our staff as we strive to continuously improve the quality of our services. Thank you again for sharing your experience, and we hope your next visit will be as pleasant as the previous one. Sincerely, VIC PAHWA General Manager Mercure Warragul ________________________________________ 23 Mason St Warragul VIC 3820 ________________________________________ T +61 (0) 3 … F +61 (0) 3 … E-mail : gm… mercurewarragul.com.au mercure.com | accorhotels.com Information in this email including any attachment ('email') is confidential, may be privileged and is intended solely for the addressee. Unauthorised recipients are requested to preserve the confidentiality of this email, advise the sender immediately of any error in transmission, and then delete the email from the recipient's mailbox without making copies. Any disclosure, copying, distribution or action taken, or omitted to be taken, in reliance upon the contents of this email by unauthorised recipients is prohibited and may be unlawful. Dear Peter H., We very much appreciate your comments regarding your stay at the Mercure Warragul. It is always a pleasure to receive positive feedback. I will share your comments with our team. I am sure that this feedback will serve as an encouragement to all of our staff as we strive to continuously improve the quality of our services. Thank you again for sharing your experience, and we hope your next visit will be as pleasant as the previous one. Sincerely, VIC PAHWA General Manager Mercure Warragul ________________________________________ 23 Mason St Warragul VIC 3820 ________________________________________ T +61 (0) 3 … F +61 (0) 3 … E-mail : gm… mercurewarragul.com.au mercure.com | accorhotels.com Information in this email including any attachment ('email') is confidential, may be privileged and is intended solely for the addressee. Unauthorised recipients are requested to preserve the confidentiality of this email, advise the sender immediately of any error in transmission, and then delete the email from the recipient's mailbox without making copies. Any disclosure, copying, distribution or action taken, or omitted to be taken, in reliance upon the contents of this email by unauthorised recipients is prohibited and may be unlawful. Dear Don F., We very much appreciate your comments regarding your stay at the Mercure Warragul. It is always a pleasure to receive positive feedback on rooms. I will share your comments with our team and your feedback on food with Newmason management. I am sure that this feedback will serve as an encouragement to all of our staff as we strive to continuously improve the quality of our services. Thank you again for sharing your experience, and we hope your next visit will be as pleasant as the previous one. Sincerely, VIC PAHWA General Manager Mercure Warragul ________________________________________ 23 Mason St Warragul VIC 3820 ________________________________________ T +61 (0) 3 … F +61 (0) 3 … E-mail : gm… mercurewarragul.com.au mercure.com | accorhotels.com Information in this email including any attachment ('email') is confidential, may be privileged and is intended solely for the addressee. Unauthorised recipients are requested to preserve the confidentiality of this email, advise the sender immediately of any error in transmission, and then delete the email from the recipient's mailbox without making copies. Any disclosure, copying, distribution or action taken, or omitted to be taken, in reliance upon the contents of this email by unauthorised recipients is prohibited and may be unlawful. Dear Fiona L., We very much appreciate your comments regarding your stay at the Mercure Warragul. It is always a pleasure to receive positive feedback. I will share your comments with our team. I am sure that this feedback will serve as an encouragement to all of our staff as we strive to continuously improve the quality of our services. Thank you again for sharing your experience, and we hope your next visit will be as pleasant as the previous one. Sincerely, VIC PAHWA General Manager Mercure Warragul ________________________________________ 23 Mason St Warragul VIC 3820 ________________________________________ T +61 (0) 3 … F +61 (0) 3 … E-mail : gm… mercurewarragul.com.au mercure.com | accorhotels.com Information in this email including any attachment ('email') is confidential, may be privileged and is intended solely for the addressee. Unauthorised recipients are requested to preserve the confidentiality of this email, advise the sender immediately of any error in transmission, and then delete the email from the recipient's mailbox without making copies. Any disclosure, copying, distribution or action taken, or omitted to be taken, in reliance upon the contents of this email by unauthorised recipients is prohibited and may be unlawful. Disappointed that we were unable to use our accumulated Accor points to help defray costs, especially as we were required to book into a hotel or lose the points by an arbitrarily set deadline at quite short notice. Dear David E., We very much appreciate your comments regarding your stay at the Mercure Warragul. It is always a pleasure to receive positive feedback. I will share your comments with our team. I am sure that this feedback will serve as an encouragement to all of our staff as we strive to continuously improve the quality of our services. Thank you again for sharing your experience, and we hope your next visit will be as pleasant as the previous one. Sincerely, VIC PAHWA General Manager Mercure Warragul ________________________________________ 23 Mason St Warragul VIC 3820 ________________________________________ T +61 (0) 3 … F +61 (0) 3 … E-mail : gm… mercurewarragul.com.au mercure.com | accorhotels.com Information in this email including any attachment ('email') is confidential, may be privileged and is intended solely for the addressee. Unauthorised recipients are requested to preserve the confidentiality of this email, advise the sender immediately of any error in transmission, and then delete the email from the recipient's mailbox without making copies. Any disclosure, copying, distribution or action taken, or omitted to be taken, in reliance upon the contents of this email by unauthorised recipients is prohibited and may be unlawful. Dear Lynne T., We very much appreciate your comments regarding your stay at the Mercure Warragul. It is always a pleasure to receive positive feedback. I will share your comments with our team. I am sure that this feedback will serve as an encouragement to all of our staff as we strive to continuously improve the quality of our services. Thank you again for sharing your experience, and we hope your next visit will be as pleasant as the previous one. Sincerely, VIC PAHWA General Manager Mercure Warragul ________________________________________ 23 Mason St Warragul VIC 3820 ________________________________________ T +61 (0) 3 … F +61 (0) 3 … E-mail : gm… mercurewarragul.com.au mercure.com | accorhotels.com Information in this email including any attachment ('email') is confidential, may be privileged and is intended solely for the addressee. Unauthorised recipients are requested to preserve the confidentiality of this email, advise the sender immediately of any error in transmission, and then delete the email from the recipient's mailbox without making copies. Any disclosure, copying, distribution or action taken, or omitted to be taken, in reliance upon the contents of this email by unauthorised recipients is prohibited and may be unlawful. The room was clean and comfy - thanks for not burying the bed under pillows! Dear Kerry M., We very much appreciate your comments regarding your stay at the Mercure Warragul. It is always a pleasure to receive positive feedback. I will share your comments with our team. I am sure that this feedback will serve as an encouragement to all of our staff as we strive to continuously improve the quality of our services. Thank you again for sharing your experience, and we hope your next visit will be as pleasant as the previous one. Sincerely, VIC PAHWA General Manager Mercure Warragul ________________________________________ 23 Mason St Warragul VIC 3820 ________________________________________ T +61 (0) 3 … F +61 (0) 3 … E-mail : gm… mercurewarragul.com.au mercure.com | accorhotels.com Information in this email including any attachment ('email') is confidential, may be privileged and is intended solely for the addressee. Unauthorised recipients are requested to preserve the confidentiality of this email, advise the sender immediately of any error in transmission, and then delete the email from the recipient's mailbox without making copies. Any disclosure, copying, distribution or action taken, or omitted to be taken, in reliance upon the contents of this email by unauthorised recipients is prohibited and may be unlawful. Dear Eleanor G., We very much appreciate your comments regarding your stay at the Mercure Warragul. It is always a pleasure to receive positive feedback. I will share your comments with our team. I am sure that this feedback will serve as an encouragement to all of our staff as we strive to continuously improve the quality of our services. Thank you again for sharing your experience, and we hope your next visit will be as pleasant as the previous one. Sincerely, VIC PAHWA General Manager Mercure Warragul ________________________________________ 23 Mason St Warragul VIC 3820 ________________________________________ T +61 (0) 3 … F +61 (0) 3 … E-mail : gm… mercurewarragul.com.au mercure.com | accorhotels.com Information in this email including any attachment ('email') is confidential, may be privileged and is intended solely for the addressee. Unauthorised recipients are requested to preserve the confidentiality of this email, advise the sender immediately of any error in transmission, and then delete the email from the recipient's mailbox without making copies. Any disclosure, copying, distribution or action taken, or omitted to be taken, in reliance upon the contents of this email by unauthorised recipients is prohibited and may be unlawful.